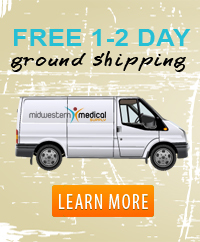 Midwestern Medical Supply knows that not every product works for every customer and that’s why we offer a generous return policy on all items that ship standard FedEx or UPS to ALL of our customers. Our customers have up to 30 days to return an item that is considered returnable and is in brand new condition with original packaging for a refund minus 10% restocking (industry standard restocking is 25%) and shipping cost both ways. If any of our items are damaged upon delivery, we allow per Manufacturer up to 72 hours for inspection and damage reported to us for full replacement. All of our equipment and supplies come with the assurance that if the item is damaged in any way upon delivery we will pick it up at no cost and expediently replace it with another. 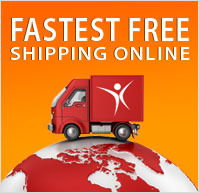 When shopping with us you can feel safe knowing you will get delivered to your door the exact item you see and read about on our WebSite. Non returnable items include all items that are shipped Freight and all Hygiene Products. Feel free to call us anytime at 1(800)274-9377 and put us to the test, you will not be disappointed.